When I first began this blog back in 2006 I had scarcely read any American fiction. I had had a shameful but unrestrained passion for Sweet Valley High books in my early teens and had loved Nancy Drew and Peanuts just as fervently as a child. The first blogging challenge I ever undertook was a summer of reading American literature, and one of the first books I read for that challenge was Jane Smiley’s A Thousand Acres. I thought it was magnificent; a retelling of King Lear set on a midwest farm where people might so easily go a little crazy at the mercy of the elements, the uncertain income from crops and the judgemental gazes of their all-seeing neighbours. It introduced me to the American style of storytelling: simple, direct, vivid, powerful. Now Jane Smiley has returned to farming territory with her new novel, the first in a trilogy spanning the last hundred years of American history. Some Luck follows the fortunes of the Langdons from 1920 to 1953 with a chapter for each year. If this sounds schematic, it isn’t. It’s a brilliant device deployed with Smiley’s deft, clever insight into the way stories work. Shifting perspective continually through the numerous heads of the Langdon clan gives us a taste, as sharp as vinegar and as strong as black coffee, of the flavour of each year, as the fortunes of the family interact with those of the world around them. Books are three-dimensional object – they take time to read – and as the chapters pass so we feel history as it burgeons and blossoms. We pass through the long, dusty years of Depression, aware in a newly vivid way how long that dreadful slump lasted, and through the Second World War. When the book ends, McCarthyism is in the air, all set to impinge on the family in ways we can already anticipate with a shiver. The story starts with Walter and Rosanna Langdon growing accustomed to their new, mortgaged farm, and their new, lively son, Frank. Frank is bold and stubborn, even as a toddler, and over indulged by his mother according to Rosanna’s sister, Eloise, living with the family to lend a helping hand. Rosanna’s next son, Joe, is the product of a difficult birth and is altogether a more withdrawn character, easily hurt, rarely happy. Mary Elizabeth is good but doomed, Lilian an angel child, her mother’s favourite, Henry a book worm, Claire the best-loved of her father. Eloise leaves to further her education in Chicago where she becomes caught up in Communism. Rosanna turns to religion for support in a life that seems ever more hostage to fortune. Frank is naturally adept at fixing bullies in the playground, but torments his own younger brother. Rosanna cannot help but tell Lilian that a miracle has occurred, when a well that seems to have run dry produces more water again. She knows Walter would disapprove of such fanciful thinking. The farm horses are finally retired in favour of the tractor, electricity arrives at the farm. So life runs on in the novel. Events arise, some world-shaking but seen only out of the corner of a character’s eye, so to speak, some local but devastating. As the family grows, so the story becomes more complex, more gripping as we grow attached to the characters, who have ever more at stake. Families are the crucibles of culture; they are where the political, economic and ideological buck stops. In the family, the most powerful changes out in the world are gradually filtered down and experienced as daily life. What Jane Smiley manages so effortlessly and so engagingly to bring together is this sense of forces colliding in family life. Frank is a great case in point; he isn’t just the product of his parents and his upbringing; he becomes a man with a whole new sensibility that is shaped by the changing tide of history. We don’t see everything with Smiley’s structure – much happens off stage, beyond the margins of the page. But everything we see has an impact on how the family lives and loves, who the children become, and we fear for the future, having some knowledge of what it holds. Amazing storytelling, in a novel that I think will have to end up on my best of the year list. I’m so glad you enjoyed this as much as I did. It’s the perfect way to tell the story of a country when executed by such a deft hand. It ends leaving you desperate to know what happens next but we’ll have to wait until May when the next one’s out. I’m also keen to see how Smiley imagines what happens between when she finished writing the trilogy and when it concludes in 2020. Ah I wondered how long I would have to wait – until May then. I am so looking forward to the next part! And I completely agree: Jane Smiley’s take on the future will make for fascinating reading. This is a great and really convincing review: I’m adding Some Luck to my wish list. I really enjoyed Private Life, which came out a couple of years ago; I never finished Moo, though, so for me it’s hit or miss with Smiley. Moo is the one novel of Jane Smiley’s that I didn’t enjoy either. I get the feeling this one is much closer in character to Private Life (which I have to read but haven’t got to yet) and I think you would enjoy it! Would love to know what you make of it, in any case. I also thought I’d washed my hands of Smiley after Moo, but now I’ll have to try this one. 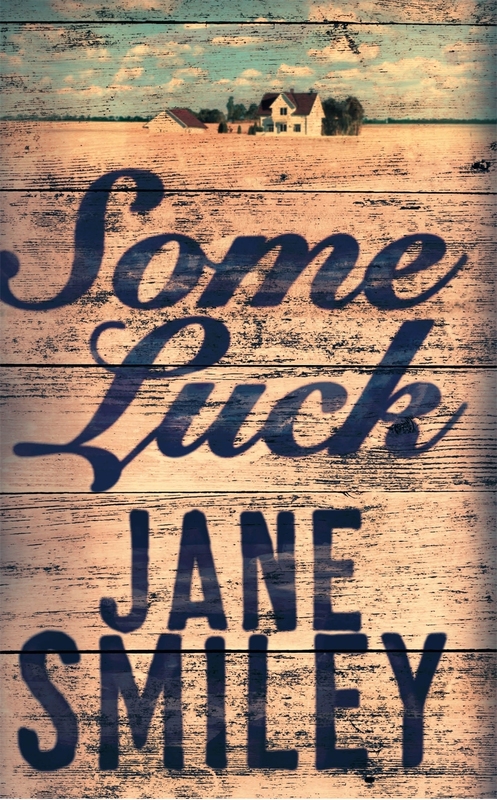 I haven’t read any Jane Smiley in years but I absolutely LOVED this book–it made it onto my Top 10 Fiction list that I posted yesterday. I was so excited to hear that the next book in the trilogy is due out in May–much sooner than I expected! Hurray! I’m so thrilled that you loved it too. And I was pleased to know I only have to wait until May as well! How bad am I that I have yet to read Smiley? I have several of her books and keeping meaning to, but… I really must get to it! I’ve never read anything by Jane Smiley, but this seems to be something people either love or hate. But I’m going to trust you on this one since you have not steered me wrong yet (always a first time, Litlove – wink). And if the story and writing are good enough, I love a good trilogy. I think you’d like this one, Grad. It’s got lots of interesting characters, you really get engaged in the survival of the family, it’s beautifully written and wholesome of heart. But you’re right – there’s bound to be a first time! 🙂 I’d love to know how you get on with it, whatever you feel about it! Must read more Jane Smiley. I liked her as a teen cos she was accessible – what’s not to like for a teen in the dramatic tale of abuse and favouritism amongst sisters? Later on, I read a book where this girl got obsessed with an older couple… very different subject matter. I admired the way she was able to write both so convincingly. This sounds convincing too. Yes, that’s a good word to describe her writing. I have huge admiration for authors who can bring the reader into a vivid, evocatively-imagined world. Her stories feel very real, and I do appreciate that. She IS convincing. Ah the beauty of living in the UK is that I don’t ever get to feel overwhelmed by stories about the American Midwest, though I can see it might be a problem! However, when they’re written by authors like Jane Smiley or Willa Cather, then I’m definitely up for them. Smiley does it really well, I think – would love to know what you make of it! Oh the story of my life–I had this out from the library when it first came out, but didn’t get to it and couldn’t renew as the line was so long. Hanging head in shame to say I have not ever read Jane Smiley either. I sometimes wonder what on earth I do read when I read other people’s blogs. I swear I read all the time but…. I don’t tend to pick up ‘literary’ fiction as often as I should–though I buy it readily enough. One of my few (maybe almost my only) goals for next year is to read more books like this. Maybe I should start with A Thousand Acres. I have been thinking of this–what to read–my small pile of choices hovers at the moment with The History of Love, Gilead, The Yiddish Policemen’s Union and now Jane Smiley….. Any favorites of your own–I suspect you have read most if not all from my little shortlist of books. I loved A Thousand Acres as well. Such an astonishing book. I never picked any f her others fearing I m ight not like them as much but this does sound excellent.